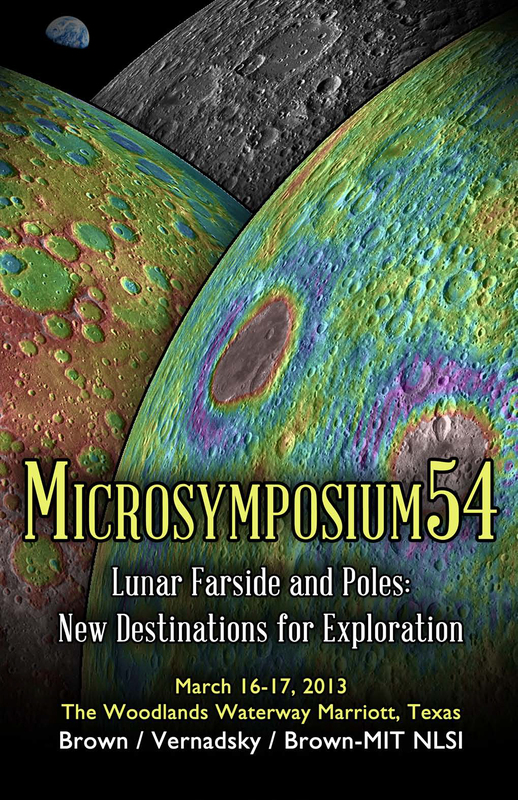 You are cordially invited to attend Microsymposium 54, Lunar Farside and Poles: New Destinations for Exploration, March 16-17th, 2013, at The Woodlands Waterway Marriot, The Woodlands, Texas, just prior to LPSC 44. The Earth’s Moon provides a fundamental frame of reference for understanding the formation, early history, and evolution of terrestrial planetary bodies. The initial era of exploration of the Moon (Apollo and Luna) focused on the lunar nearside, and using these data, paradigms were developed to explain the nature of its chemical layering (crust, mantle, and core), its mechanical layering (lithosphere and asthenosphere), and key lunar processes (accretion, differentiation, thermal evolution, impact cratering, volcanism, and tectonism). We are experiencing a Renaissance in lunar exploration. In the last decade and in the coming years, an international armada of spacecraft (China, ESA, India, Japan, Russia, United States and X-Prize) is changing the perception of the nature of the Moon, its origin, and its evolution. These missions to date have provided new global coverage, with particular insights for the Lunar Farside and Poles. Parallel exploration of the Solar System beyond the Earth-Moon system has placed the Moon in the context of other planetary bodies. What is this Renaissance teaching us about the utility and applicability of the traditional lunar compositional, interior, and historical paradigms (as described in New Views of the Moon; Joliff et al., 2006)? What ideas has it challenged? What new questions has it raised? What is unique to the Moon and what is thematic in terms of planetary evolution? How do these evolving concepts inform us about the outstanding new questions and how do these concepts frame a new strategy for future exploration of the Moon? The goal of Microsymposium 54 is to present a summary of these new discoveries, and to bring together representatives of the geology, mineralogy, petrology, spectroscopy, geochemistry, geophysics, and dynamics communities to discuss these new findings and to ponder their implications for the next generation of significant scientific problems. A critical aspect of this discussion will be to assess the implications of this new perspective for future goals and destinations for robotic and human lunar exploration. Key questions and focal points include: 1) What was the nature of the Moon-forming impact and the following lunar accretionary history? 2) How does the tidal evolution of the Moon immediately post-formation affect its early evolution? 3) What is the role of South Pole-Aitken and other major impacts in re-distributing crust? 4) How can the global impact cratering record of the Moon provide keys to the early bombardment history of the inner solar system, including the “lunar cataclysm”? 5) What is the global nature of the lunar “magma ocean-derived” primary crust and its segregation from the mantle? 6) What does the spectroscopic discovery of new minerals tell us about lunar crustal evolution? 7) What is the nature and significance of the aftermath of primary crustal formation, density stratification and inversion and what is its role in farside-nearside secondary crustal formation? 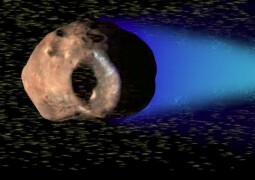 8) What are the causes of the lunar magnetic field and its cessation? 9) What are the major stages in the thermal evolution of the Moon? 10) What are the sources and sinks of volatiles and where and why are they sequestered? The Microsymposium will be held at the Woodlands Waterway Marriot Hotel and Convention Center, March 16-17th, 2013, at the site of the 44th Lunar and Planetary Science Conference taking place March 18-22, 2013. Microsymposium 54 will begin at 1 PM on Saturday, March 16th, and will conclude Sunday, March 17th, by 1 PM. The Microsymposium will emphasize open discussion format and will be anchored by invited overviews, commentaries and posters. We ask that requests for posters be submitted no later than January 11, 2013 through the registration site. If you are interested in participating in Microsymposium 54, please complete the registration form online. Those wishing to attend the conference can register at any time, including up to the time of the conference, but advance notice helps us to plan refreshments and seating. Please forward this announcement to interested colleagues and students. For the program, please visit Microsymposium 54. We look forward to seeing you at Microsymposium 54 and LPSC 44! Co-Sponsored by Brown University, the Vernadsky Institute, and the Brown-MIT NASA Lunar Science Institute.